Krabi was unknown a few years ago, but today it is considered one of the most famous destinations for relaxing, thanks to its intense, dramatic beauty and its sunny, pristine beaches. 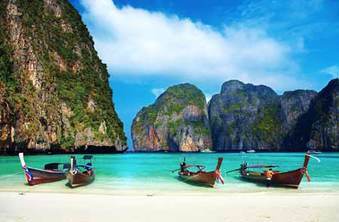 The Krabi beaches with tropical vegetation and enormous lush rocks create a fantastic yet dramatic landscape. The hotels are limited, so the area and the landscape are kept undamaged by the crowd of visitors. O the terrestrial beauties of the jungle are of a great interest with the caves, which are ideal for exploration.